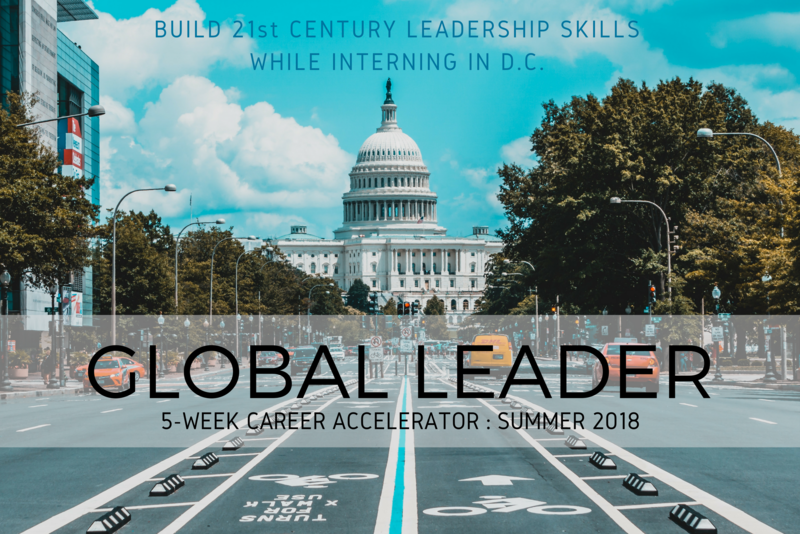 Global Leader is a career development and leadership accelerator that builds 21st century employability skills for college students and young professionals interning in Washington, D.C. 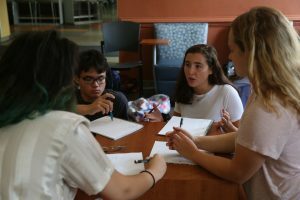 Through experiential workshops and expert-led seminars, Global Leader prepares entry-level interns for a future of work in the field of international affairs and development. The 5-week curriculum is a part-time course designed around internship commitments; with modules in Diversity and Inclusion, Complex Problem-Solving, Strategic Communications, Entrepreneurship, and Career Mapping. Delivered by our expert trainers, the Global Leader program is a highly marketable add-on to professional resumes and job and college applications for ambitious change-makers looking to leverage a high-impact career. Global Leader is a new training program, launched by AMP Global Youth in the summer of 2018. Based in Washington, D.C., our small and selective cohort of young professionals learns what it takes to enter the fast-growing field of international affairs and development in the very place where careers get made. Diversity and Inclusion: In an increasingly globalized world, diversity and inclusion is an important practice for businesses and organizations looking to stay ahead of the social, economic, and innovation curve. Like this, diversity and inclusion becomes an important knowledge base for entry-level employees in the working world of today and tomorrow. This module offers an anti-oppressive understanding of identities and the ways in which we can create shared spaces that are equitable and inclusive for all. Complex Problem-Solving: In the face of global challenges and artificial intelligence, the ability to solve problems is more and more in demand. Our future workforce must be equipped with the tools to deeply understand systems-level issues at their root cause by embracing the complexity and connectivity that characterizes our modern-day context. Strategic Communications: Communications skills are necessary for almost any international career setting, in whatever medium. This module builds a suite of communicative art forms to strategically pick and choose from, including; persuasive writing, public speaking, pitching, debating, press release writing, and blogging. Here the focus is not the needs of the speaker, but the needs of the audience as the most important skill-builder here is empathy. Entrepreneurship: The entrepreneurial skill-set has been exponentially trending for the past decade regardless of the field, sector, or industry. While it is usually associated with starting up a business independent of any established organization, financially-constrained organizations in the third sector have turned to social enterprise as the answer. This module offers a version of entrepreneurship that is suited for the workplace and focuses on building a business from the inside out – also known as intrapreneurship. Career Mapping: While the labor market has experienced chronic youth unemployment and underemployment, the range of job types has also widened in the digital age. As a result, entry-level youth have much more choice but much more responsibility to make the smart choice – for a career which fulfills their wants and needs. This module supports participants in having a career conversation around the problem they want to solve, the ecosystem they want to enter, and the opportunities that lay at their disposal. Application deadline: Rolling, but space is very limited. Location: The American University, Washington, D.C.
Fee includes all program and materials fees.